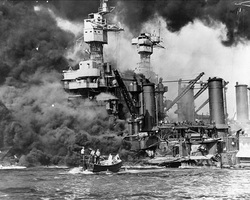 On December 7th 1941, the Japanese attacked the U.S. Naval base known as Pearl Harbor. Over 350 Japanese Fighter, Bomber and Torpedo planes attacked the Naval Base and sunk six U.S. aircraft carriers, four battle ships, 188 U.S. aircrafts. Over 2,400 Americans were killed and more than 1,200 were wounded. Why did the Japanese attack? The reasons for the attack were not clear, but historians argue that President Franklin D. Roosevelt provoked the Japanese to attack the United States because he had put an embargo on Japan preventing the U.S. and its allies from exporting steel, iron and oil to Japan. As a result, it crippled their economy and their military. Besides the embargo, the U.S. was also making advances on Japan's trade markets while they were at war, another tactic Japan felt was aimed to halt their economy. America also owned many of the territories south of Japan. Territories that America was allied with and owned, halted the southern advancement attempts that Japan was making to extend the reaches of its empire. The attack on the U.S. eventually led to the internment of people of Japanese decent in America.